In a bowl, stir together the garbanzo flour, water, and salt into a smooth paste. In a non-stick pan, melt coconut oil over medium heat; pour in the batter, tilting the pan so the batter spreads evenly over the pan. Cook for about 7 minutes or until slightly browned and flip the pancake to cook the other side. Melt coconut oil in a heavy-bottom pan; stir in ginger, cumin, and mustard seeds and cook until mustard seeds start popping; stir in water, amaranth and salt. Bring the mixture to a gentle boil; lower heat to medium low and cook for about 30 minutes or until thick and creamy. Remove from heat and stir in apple cider vinegar, turmeric, and butter. Serve the porridge sprinkled with pumpkin seeds. In a pan of salted water, boil the potatoes with skins on for about 45 minutes or until tender. Arrange bacon strips on a baking sheet and bake for about 45 minutes or until browned. Cook quinoa according to package instructions; remove from heat and let cool. In a large bowl, combine cooked quinoa, greens, chopped cucumber, fruit and herbs in a large bowl. In a small jar, combine the dressing ingredients and shake to mix well; pour the dressing over the quinoa salad and toss until well combined. Top the salad with nuts and serve. In a pan, heat oil and add the onion; sauté for about 5 minutes or until tender. Stir in garlic and red pepper flakes and continue sautéing for 30 seconds more. Stir in oregano and tomato and simmer for about 5 minutes or until the sauce is thick. .add shrimp and continue simmering for 30 seconds more. Remove from heat, stir in chopped parsley and transfer to a baking dish; top with cheese and bake for about 10 minutes or until the sauce is bubbly. Whisk all ingredients in a bowl until well blended; pour into the popsicle molds and let sit for at least 30 minutes. Insert popsicle sticks and freeze for about 4 hours or until frozen. When ready, run warm water around the molds to loosen the popsicles. Serve right away! Soak goji berries for at least 2 hours. When ready, combine all ingredients in a blender and blend until very smooth. Enjoy! Want some more? How about 30 days worth? 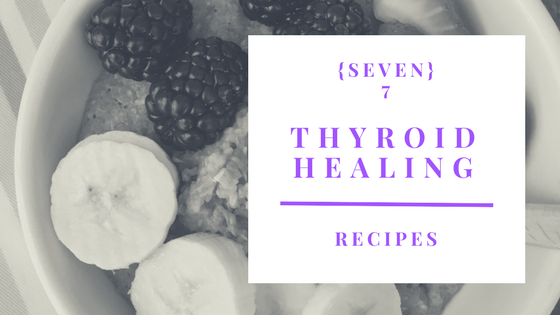 You'll get that and so much more in the Live Thyroid Well Nutrition Program. Go to www.LiveThyroidWell.com and join hundreds of others in their journey to healing your thyroid and getting your body and life back!